Hey Defenders! Thanks for coming to our bird and insect party page. Insects and birds are two incredible groups of animals with some of the most interesting features of the animal kingdom. At Critter Squad Wildlife Defenders, our birds are smart, beautiful and love to be goofballs when out at events. Now, our insects are another story. Insects are one of the most misunderstood groups of animals and easily one the most hated group of living things on the planet and you know what that means? That means they are one of the most important groups for doing educational outreach presentations with! Its doesn’t matter whether they have 6 legs, 8 legs, 10 legs or 100’s of legs our family of intriguing insects are amazing to explore and interact with. Did you know at any given time there is 10 quintillion living insects on earth and just the thought of this can give non-defenders the shivvers. So to some, this may be the creepiest, crawliest, slimiest party in town. For others it’s an unforgettable inset experience. Your birthday defenders and their defender guests will experience some of the coolest insects, like millipedes, tarantulas, scorpions, stink bugs, lady bugs, cockroaches and more. Did you know that tarantulas do not use a web for catching their food? Or that scorpions have 8 legs? Did you know that scorpions are one of the many insects that take care of and look after their young? 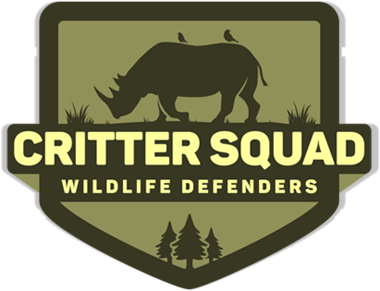 Well our Critter Squad Wildlife Defender educator will teach you all about the amazing facts and dispel all the horrible myths and rumors about these interesting insects. Become a defender and book TODAY! Have you ever clucked with a chicken? Seen a macaw crack open a peanut? Or said “Hello!” to a parrot? Critter Squad Wildlife Defenders have a special flock of chatty birds that love to spread their love and beautiful colors onto all parties and events. Your birthday defender and their defender guests will want to fly with excitement after meeting all our bird ambassadors.